Well, it was all wet and wild at the end of last week. 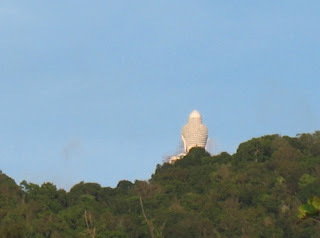 Check out the previous post (Phuket Weather: Friday July 18th 2008). And you know, I reckon the weather Gods were listening. So we got our good weather for my daughters 7th birthday party, though it did rain heavily in the night and the last few party stragglers got wet on the way home. Thanks Gods. I knew you would not be so cruel as to ruin a kid's birthday! Actually it must have rained pretty hard on Saturday night, as the garden was all soggy in the morning. Sunday was dry too, and today has been very nice weather. Despair ye not, sun seekers! 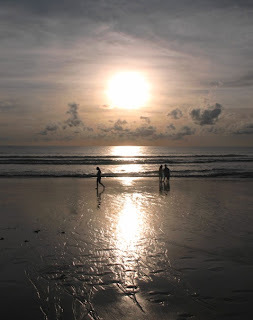 A little before sunset I took a walk on Karon Beach. It's a beautiful time of day, the sunlight reflects off the golden sand, the sky is a thousand colours. There were very few people on the beach. 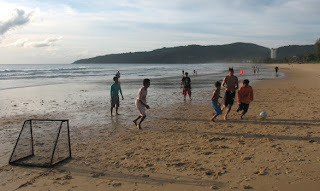 A few tourists, a few fishermen, a bunch of guys playing football. Some of the guys were actually beach guards and while I was there I witnessed a rescue. You have to be careful at this time of year. The sun may shine, the beach may be golden, but Karon can have some sizeable waves, and it's easy to get out of your depth. One of the football players dashed off where a kid was in the water. Mum was shouting. Kid was rescued before she got into real trouble. See photo below. If you come to Phuket, please try not to drown. I have linked to this before and will link again: Tips on Not Drowning by Tezza. Up above Karon you can see the top of the Big Buddha. The statue actually faces east, so from here you can see the back of Buddha's head.